I'm in the midst of reading a group of new books recently released that I picked up online. 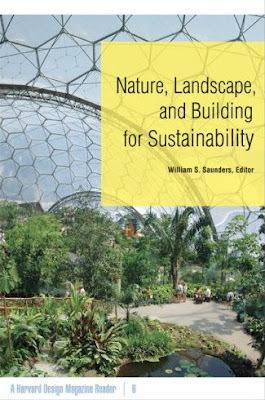 The first Nature, Landscape, and Building for Sustainability, edited by William S. Saunders, is the sixth in a series of Harvard Design Magazine Readers (published by Univ. of Minnesota). This entry in the series specifically focusing on landscape and our inevitable struggles with nature versus culture - amongst a range of other articles that have run periodically through the Harvard Design Magazine over the years. Ok, for full disclosure, I'm actually re-reading most of this information, as HDM was nice enough to publish PDFs of a number of these articles previously - which made me excited, but a little bummed when I got the book. Not for the content, but a feeling of lacking new info. It is nicely packaged in a small-format paperback which is great for reading on the bus. The following is my in-process view, as well as the reflection on the work as a whole. Thus the fifteen essays in this book are part of the discussion, although not a solution, merely, "...recognizes a human rift with nature, strives to understand its cause, contemplates a resolution, and offers meaningful steps toward reconciliation." (vii) And that's just the first page. Elsewhere in Part I, essays by Albert Borgmann (Ch.1) gives an [literally] exhaustive overview of mystical nature and our need to return to this state in his essay 'The Destitution of Space: From Cosmic Order to Cyber Disorientation'. This part redeems with a couple of fine essays by Catherine Howett (Ch.4) 'What Do We Make of Nature Now?' and John Beardsley (Ch.5) 'Kiss Nature Goodbye: Marketing the Great Outdoors'. Beardsley tackles the homogenization of nature as packaged by stores such as REI, and the impacts of our created artificial nature on our psyche. Part II: Designing (for) Nature, delves into action (sort of). A couple of essays to start span policy and ethics - including one by Rossana Vaccarino (Ch.7) 'Nature Used and Abused...', and Susannah Hagan (Ch.8) 'Five Reasons to Adopt Environmental Design'. Vaccarino delves into Gifford Pinchot's ideology of sustainable forestry and our notions of nature as a tabula rasa - devoid of human occupation and meaning. Hagan follows this up with a treatise on the difficulty of capturing the movement and dynamism of natural processes. The thread continues with essays by architect Peter Buchanan (Ch.9) 'Invitation to the Dance...', which discusses the impact and potential of sustainable projects like BedZED, as well as Robert France's (Ch.10) reverse homage to Thayer in 'Green World, Gray Heart? The Promise and Reality of Landscape Architecture in Sustaining Nature.' France definitely strikes a nerve in the LA as artist versus LA as ecological designer debate, by focusing on poignant combinations of both in tandem. This fits nicely into the final word, a work from art historian John Beardsley (Ch.15) 'A Word for Landscape Architecture,' provides apt summary of the concept and context of all of these writings. " In summary, overall I'm a big fan of 'readers' as a way to summarize and gather a range of disparate thoughts into one volume to provide a span of experience for the reader. It seems in a single-author/concept book - the idea or voice is often stretched too thin to accomodate the weight (or cost) of publication - and thus it get's fleshed out in graphics, typography, or formatting to give it the necessary gravitas. In this case, the essays chosen were diverse - allowing for many points, concise - giving a taste and most often leaving you satisfied, and coherent - there were a few turns into academic drudgery, but for the most part were a quick and fun read. This would be a great companion for a theory studio - and one worth a read from practioners as well. For another HDM read from the latest issue, check out Kristina Hill and Jonathan Barnett's article on 'Design for Rising Sea Levels'... good stuff - and probably in the next version of the reader... where it can be re-read again.